Old Trafford's damaged reputation as an international venue suffered a further setback on Tuesday evening, when the second Twenty20 international between England and Australia was abandoned without a ball being bowled due to waterlogged bowlers' run-ups at the Brian Statham End of the ground - leading to an ECB investigation into an untimely embarrassment for the sport, as well as recriminations among Lancashire's beleaguered executive. Heavy afternoon rain in Manchester meant that the match was always likely to be under threat, just like Sunday's first Twenty20, which was abandoned after seven balls of England's reply. Umpires Nigel Llong and Peter Hartley conducted their first inspection at the scheduled start time of 7pm, and though the weather cleared sufficiently for all the covers to be removed from the pitch, they announced the abandonment one hour later, after a second inspection, much to the frustration of a capacity Lancashire crowd. "This is a disaster that could have been avoided, and I'm angry and bitterly disappointed," Lancashire's chief executive, Jim Cumbes, said. "Angry because, to my mind, we were told when we started playing Twenty20 cricket that you should be expected to play in conditions that you wouldn't normally be expected to in first-class cricket, which I understand and accept. "If that had been Lancashire against Yorkshire with 16,000 people, we would have been playing. That's my honest opinion," he added. "If we can't do that at international level - and I accept, if that's the case, fine, then let's not play it at international level - you are going to meet those conditions more often than not, especially in this country." The problems arose due to a torrential afternoon thunderstorm, which was followed by steady showers until around 6pm. When the covers were finally removed there was a soft area just behind the stumps, right in the take-off zone for the likes of Brett Lee, Mitchell Johnson and Stuart Broad, at the area where the pitch cover and the sheeting met. "Why should a two-metre square area stop a game of cricket?" asked Cumbes. "That's my point exactly, I don't think it should have. I don't think it was unsafe, I don't think there's any explaining to do, and the ground did not tread water." 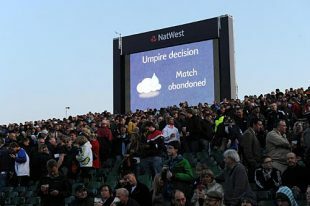 The umpires inspected on two occasions and told the captains, Paul Collingwood and Michael Clarke, that they thought conditions weren't fit before play was abandoned to the sound of booing at 8pm. The ground authorities hadn't even bothered turning the floodlights on, a sure sign that there were serious doubts about the contest all along. It completed a depressing double whammy for Lancashire following Sunday's match which was called off with England limping at 4 for 2 after 1.1 overs of their run-chase. "I spoke to Michael and we agreed that if it's an area where you are asking your boys to run in 100%, it's going to be pretty dangerous," Collingwood said. "I sympathise with everyone who has turned up, there was another full house. We were desperate to play the game but if conditions aren't fit, they aren't fit." Clarke said: "We are all disappointed with the result, but I think the decision that has been made was the right decision. We asked the groundsmen to do everything they could to get the ground fit, unfortunately the ground wasn't fit. The reason we tried so hard was because there was a full house and we gave it every shot possible, but the fact is the umpires made the decision the ground wasn't fit and I believe it was the right decision." Neither captain supported the theory that, because Twenty20 was essentially created as a tool to draw the crowds, the players should have come out regardless of the conditions. "It is entertainment but you've got to have the right conditions to play the game," Collingwood said. "There are international cricketers who would be putting injuries at risk on that kind of surface." Clarke added: "Any time you put on your country's colours you want to play your best cricket whatever the form of the game. No doubt Twenty20 has become a huge part [of cricket], but you are still representing your country and what to do as well as you can." The public will get their money back, but that doesn't help Old Trafford's tattered reputation as an international arena. They are currently in the first stage of a massive redevelopment plan with the hope of bringing Test cricket back to the North West, but sadly for Lancashire a roof is not part of the project. Old Trafford, as with all international grounds in the country, has installed state-of-the-art new drainage beneath a relaid outfield. However, because the club is turning the square to face north-south at the end of the 2010 season, the drainage doesn't run right up to the square itself. Earlier this season the one-day international between England and West Indies at Headingley was abandoned without a ball bowled because their drainage system hadn't bedded in and couldn't cope with a morning deluge. "The new drainage system is fine, there's no problem with it," Cumbes said. "When I went out to look at the problem spot, I fully expected to be treading water, but there's none there. It's soft, of course it is. I know the umpires have tough decisions to make and I'm fully aware of player safety - I played the game for 20 years myself - but there comes a time when you have to think about the people who paid £50 to come in to the game. Sometimes I think we'd rather play in front of empty stadiums." It hasn't been a good season for Lancashire when it comes to hosting important Twenty20 matches. Their domestic quarter-final against Somerset was forced into a bowl-out in the indoor school after days of heavy rain left the ground saturated. On that occasion they didn't have to turn 20,000 supporters away ... but they still lost.